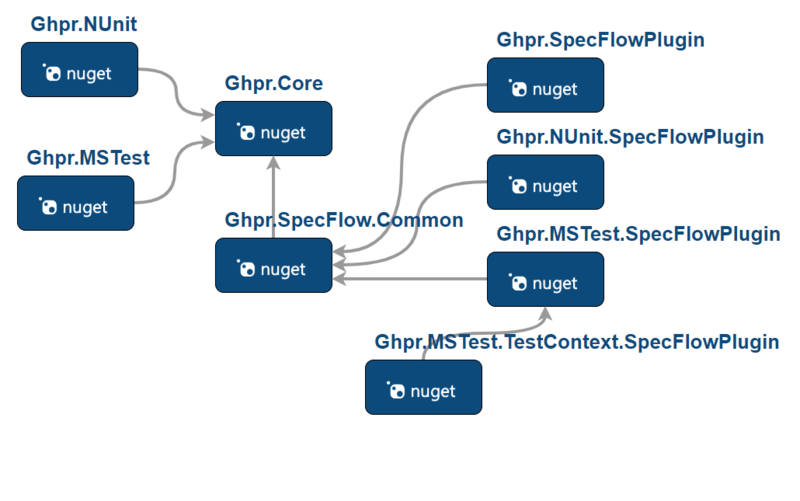 .NET QA Reporting Tool which gives you awesome real-time test run reports clear to everyone in your team. 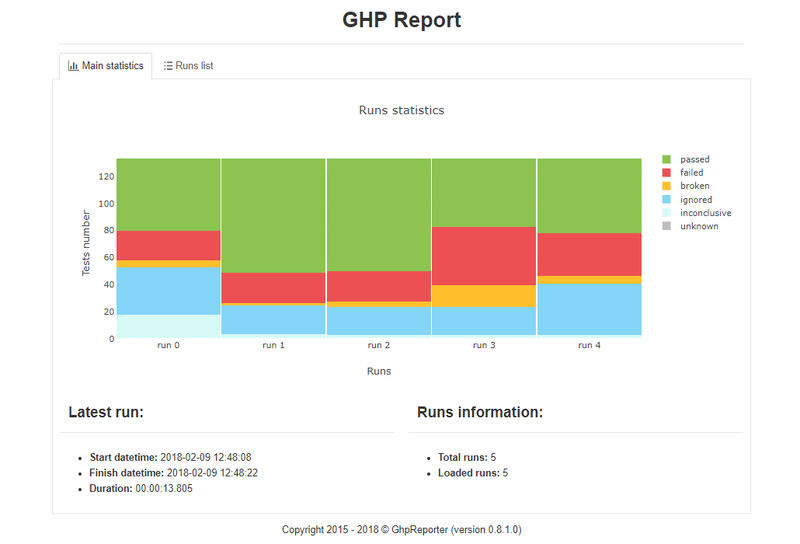 GHPReporter is free and open-source product. You can download our source code, create an issue or pull request. We use GitHub Pages style. This style is simple and familiar to millions, which makes reports easy-to-use for everyone. Easy to include in any project, easy to read reports. We use MIT License. You are welcome to contribute. You don't need to wait for all tests to finish. Explore results now! You can take screenshot at any time you want. Useful for UI tests. You can specify different settings to meet requirements of your project. No server required. You can view report in any browser without running server. You can visualize test data and display it in the report. Report main page shows overall test runs summary and information about the latest run. You can see number of tests sorted by their result: passed, failed, broken, ignored, inconclusive or unknown. You can also go to "Runs list" tab and open tests run page. Run page contains detailed information about one test run. 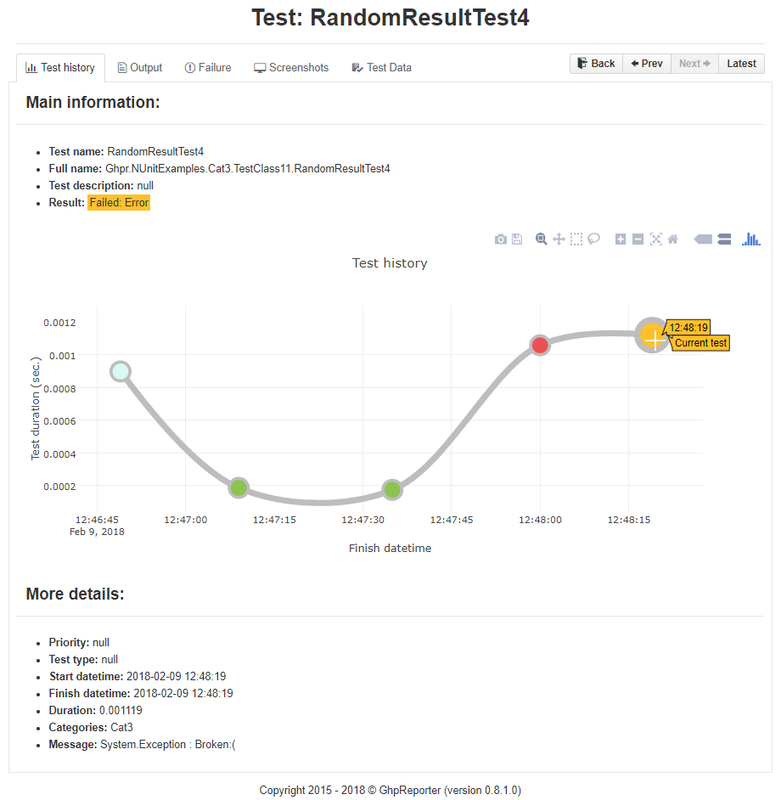 "Main statistics" tab shows start and finish datetime, and short summaary about executed tests. 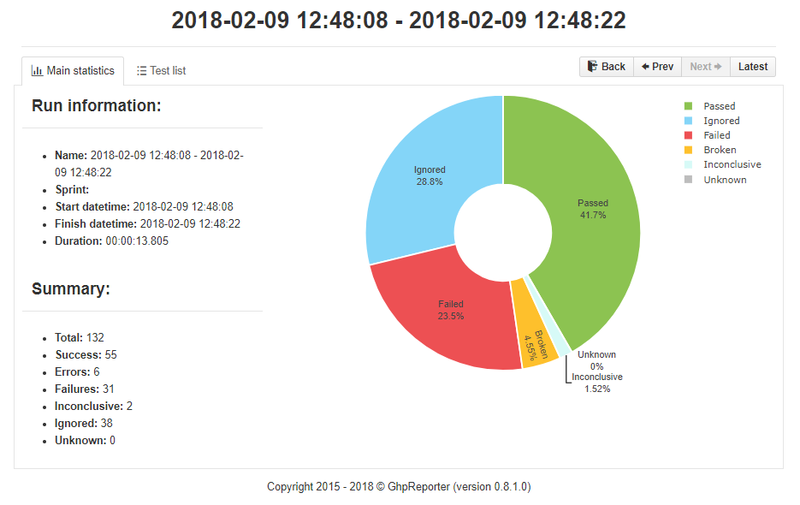 Donut chart shows percentage of each test result categories. "Test list" tab displays all executed tests during current test run. You can choose any test and view detailed information. This page shows detailed information about current test. "Test history" tab contains history of all test runs. The chart shows test runs duration, each dot color corresponds to test run result, so you can easily find out when your test became broken. "Test output" tab shows current test log.